Throughout the month of August, we’ll be bringing you an exclusive look at Archiact’s Evasion, a cooperative bullet-hell FPS in VR. We teamed up with the developer to get access to in-depth information on each of the four classes in Evasion. We’ll dive into their strengths, abilities, and even some of the lore behind how they fit into the Vanguard. Last week, Archiact gave us a look at the Striker, Evasion’s damage dealer. Today’s deep dive looks at the Engineer, a special class that hacks together unique weapons. Check out last week’s Striker profile. If you need a refresher, take a look at the Vanguard as a whole, Evasion’s top-tier combat unit. This profile is once again courtesy of Evasion’s Narrative Designer Peter Boychuk. After the Slaughter of Ajax Six, when a entire regiment was decimated during the First Optera War, Terran High Command realized the futility of using shock and awe tactics against a foe who could instantly teleport huge numbers of troops over vast distances. A decision was made to assemble an elite team that could swiftly mobilize to hot spots and operate behind enemy lines. Because they would be working with little to no tactical support, this team would be comprised of the top recruits and would receive the best training and equipment. They called them the Vanguard. Initially, there were no separate classes of Vanguard. However, as Command began using them more and more (which resulted in their missions becoming increasingly multivalent) the need for areas of specialization became apparent, so the Vanguard was broken into four classes: Striker, Surgeon, Warden, and Engineer. Each hero class has unique avatars, custom armor, a distinct energy shield, a specific blaster variant with a powerful charge shot, class-specific tether abilities and a special Surge Attack. 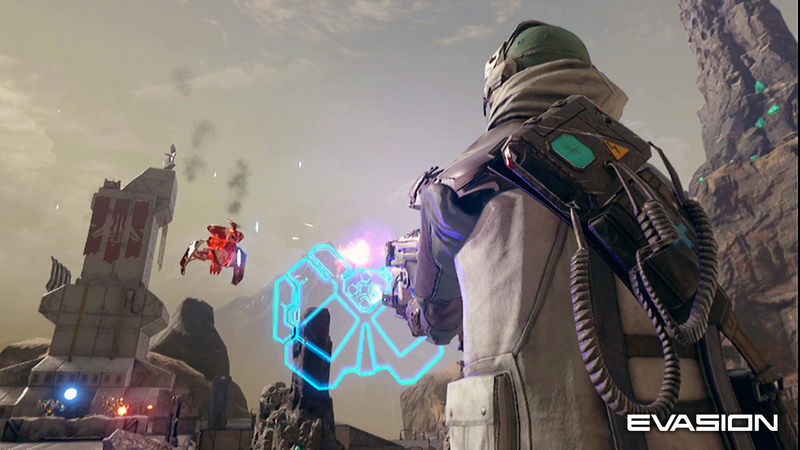 Unlike many other shooters, players in Evasion aren’t locked into one class. At any point between missions, you can visit the hangar and select a different class. The four classes have been designed to suit specific play styles. For example, players who like charging into the fray with guns blazing might find themselves gravitating to the Warden, while players who like playing more of a support role may prefer to play as a Surgeon. All classes can hold their own in a firefight and have an arsenal of deadly weapons at their disposal. 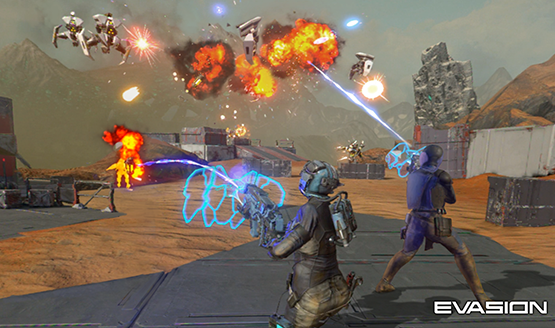 The Engineer wields an arsenal of unique weapons that were custom-built to take on Optera. Her blaster fires orbs of energy that are attenuated to disrupt their systems, she can use her Tether Lash to grab them out of the air and hurl them against buildings, and her Surge Attack can overload the systems of multiple Optera by linking them with chain lightning. A prototype weapon developed during the Battle of Vesper Four, the Arc Blaster fires orb-shaped charges specifically tuned to wreak havoc on Optera computer systems. Once sufficiently powered, the blaster emits chain lightning that can damage multiple enemies at once by overloading their systems. Like all classes, the Engineer can create a tether that can be used to help teammates (Tether Link) or damage enemies (Tether Lash). The Engineer’s Tether Link heals while channeling their overload ability through the tether, which means that the teammate can trigger chain lightning as long as they are connected. Their Tether Lash creates a unbreakable energy leash that the Engineer can use to throw enemies into the air or hurl them against a surface. Surge Attacks are the ultimate way to destroy Optera, and can only be triggered once your weapon has been sufficiently powered up. 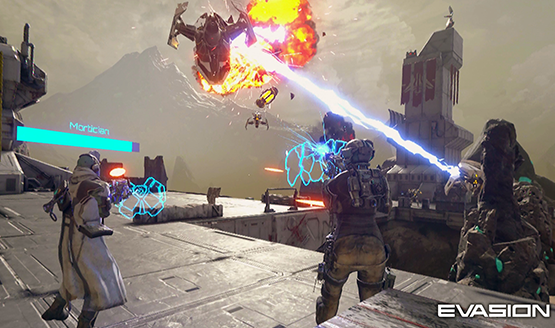 The Engineer’s Surge Attack, “Chain Reaction,” batters Optera with charges that emit chain lightning, while the tether slows the target and drains their health. Watching it light up a sky full of Optera is better than any fireworks display. If you’re bit unorthodox and delight in taking the road less taken, the Engineer is the class for you. She’s not as effective at healing as the Surgeon, nor as resilient as the Warden, but her weapons pack a wallop and she is amazing at crowd control. If the Vanguard were a racing team, the Engineer would be the girl who built her own bike. The Engineer works well with most classes, but the Engineer and the Striker are a particularly powerful duo. The Engineer can clear out large groups of smaller units while the Striker focuses her powerful weapons on taking out the more hefty Optera. Stay tuned! Next week we’ll be bringing you an in-depth look at one of the other classes (Warden or Surgeon) in our exclusive coverage of Archiact’s Evasion for PSVR. Evasion releases later this year.